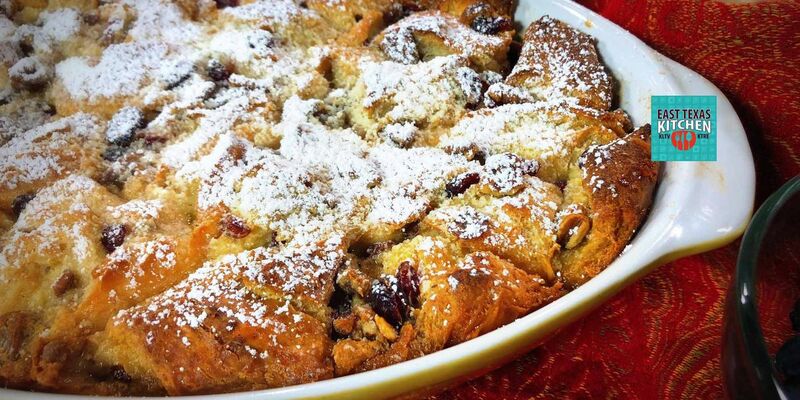 TYLER, TX (KLTV) - Chef David Wallace shares his recipe for a holiday bread pudding; decadent, beautiful and delicious! For many cooks, Bread puddings are easily accomplished. For others, not so much. The most difficult part is simply knowing how much bread to how much liquid. This recipe always works perfectly and utilizes a minimal amount of ingredients. Using eggnog eliminates the need for flavorings and seasonings and makes it a perfect choice for a Christmas Holiday dessert. Before you start, in a sauce pan, melt 1 stick butter, add 1 cup brown sugar, and cook while stirring until well incorporated. About one minute. Use some non stick cooking spray on the inside of a 2 quart baking dish. Then pour your butter/brown sugar mixture into the baking dish and allow to spread across the bottom. In a separate large mixing bowl, beat your eggs, like you were scrambling them. Add the EGGNOG and HalfnHalf creamer (or whole milk). Mix well, then add cubed bread. GENTLY toss all, coating all bread cubes. As a optional Christmas touch, I also add a 1/2 cup of dried cranberries and a 1/2 cup of chopped or whole pecans. Pour bread mixture over top of brown sugar mixture and evenly level all. Allow dish to remain in the fridge until approximately an hour before serving or cook immediately. Bake at 350 degrees for about 45 minutes. The pudding should puff up and be lightly brown on top. This dessert will hold it's heat for sometime. Lightly dust with powdered sugar. Serve with whipped cream. The butter/brown sugar mixture, will turn to caramel sauce and prevent the pudding from sticking to the bottom of the dish. Perfect Holiday dessert for family and friends or for taking to a Holiday party. If you like to spike your EGGNOG with a favorite spirit, do so when mixing bread mixture. Alcohol will cook off, but flavor will still remain.